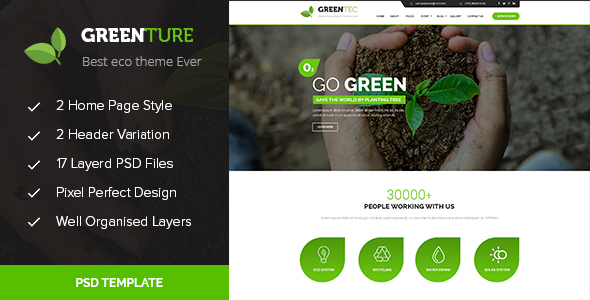 Greenture – Environment / Non-Profit PSD Template Created by CreativeGigs. This templates have specific characteristics, namely: Greenture is professional, modern crafted PSD template which can be used for Eco, Environment, Nature and related to NGO & . You can use this Greenture – Environment / Non-Profit PSD Template on Psd templates category for animal, donation, earth, environment, environmental, forest, foundation, green, natural, nature, ngo, non profit, wild and another uses. Greenture is professional, modern crafted PSD template which can be used for Eco, Environment, Nature and related to NGO & Enviroment. Here you will get 21 layered PSD with easily customizbale layer with pixel perfect design With 3 different Home version.